Smartron t.phone P is an upgrade of the t.phone from Smartron and comes with a massive 5000mAh battery. The affordable device offers quite an amazing specs for its budget price. The Indian base manufacturing company released the device first in India and it retails for Rs 7,999 ($124). The phone is the latest t.phone to join the list of t.phone series from Smartron. Comes in a full metal unibody, the t.phone P is sleek as well as affordable. It has a premium feel when you hold it, with curved edges for the perfect grip. If has a rear fingerprint sensor, which is on top the Smartron logo at the back. The rear camera and LED flash were vertically placed at the top left with the antenna line going through them. t.phone P seems a little bit bulky for a modern day device, measuring 8.9mm slim. I’m guessing this was done to accommodate the massive battery, the smartphone weighs 160g. The dual nano sim compatible device is only available in Black color, which is totally weird. We know this is the year of the bezel-less but can we forgive Smartron, since t.phone P is a budget smartphone. At least it has minimal narrow bezels with three physical navigation buttons. When in Landscape mode with the Smartron t.phone P, the details on the screen will be much taller. The 5.2-inch IPS LCD capacitive touchscreen doesn’t have any wow factor, no doubt. Nevertheless, it’s perfect for its price tag, i wasn’t expecting much from the screen. The screen boasts of a 720×1280 pixels in resolution, which is still okay. Running the show is a Qualcomm Snapdragon 435 chipset with an octa-core processor clocking at 1.1 GHz. Perform heavy multitasking thanks to the 3GB RAM space, which is more than perfect for its price. Download all your favorite games, apps and movies and store them in the 32GB internal storage space. Once its full and you want to download some more, you can upgrade up to 128GB using a memory card. Smartron t.phone P runs on Android 7.1.1 Nougat operating system out of the box with stock UI. t.phone P boasts a clear 13MP rear camera with lots of features. The rear camera also has its LED flash by the side for better photography in low light environment. While at the front, there’s a 5MP selfie camera with beautify technology and LED flash. Take selfies and make video calls even at a nightclub or dark places with the Smartron t.phone P.
Smartron t.phone P is very powerful, the battery on this baby will definitely last for more than a day with normal usage. The endurance king boasts of a 5000mAh non-removable battery, which is huge for a budget smartphone. What is Smartron t.phone P Price and Availability Status? 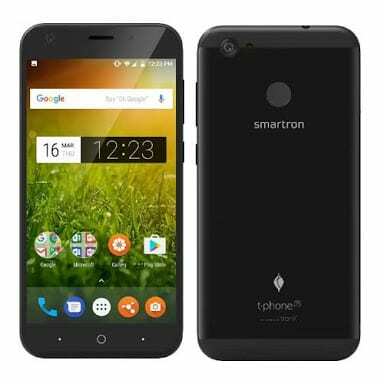 You can click on the links below to view the latest Smartron t.phone P price & availability.